Copyright Network Association for Mock Election All Rights Reserved. The Network Association for Mock Election Japan, a non-profit organization that offers a program to develop political interest among underage youth, conducted a mock election on the same day as the 23rd Upper House election held on July 21, 2013, with the support of organizations including Japan's Ministry of Education, Culture, Sports, Science and Technology. Votes were collected from 11,113 students from 34 schools raging from elementary schools to universities, which is the largest number of votes since the mock elections began. The mock election ended with a Liberal Democratic Party victory, with the party collecting about 40 percent of the vote (preliminary status on July 26, 2013). Participants found the opportunity to join the mock election worthwhile, saying "I had a chance to think of politics for the first time" and "I learned the importance of a single vote." While on the other hand, some students provided insights into the candidates, saying "The candidates from each party give cheerful speeches to adults, but they are not focusing on underage students." From the voices from school teachers, it was found that teachers struggled to raise the turnout rate because the election was held in the middle of final exam week. 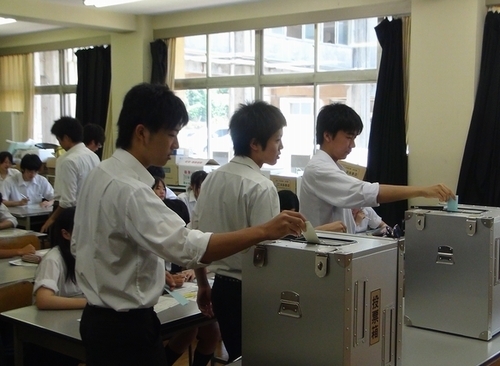 The Network Association for Mock Election Japan has been conducting mock elections since 2002, beginning with a mayoral election in Machida City, Tokyo, and has since targeted more than 20 elections, including seven national elections. Seeking ways for more students to join the program, the Association intends to promote the understanding of mock elections among schools in the midst of discussions about lowering the voting age.